Excited about ComicCon? I am. 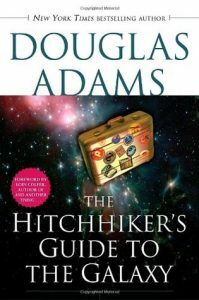 Because I was introduced to cons through science fiction conventions such as WorldCon and DragonCon, just the thought of ComicCon got me excited about reading new science fiction from our library. It’s never too early to start enjoying science fiction. 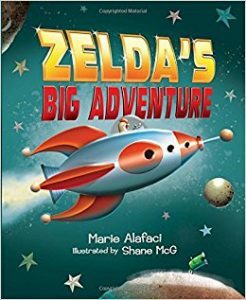 For the youngest kids Zelda’s Big Adventure by Marie Alafaci, illustrated by Shane McG is a fun variation on Chicken Little in which adventurous Zelda tries to get the other barnyard chickens to help her build a rocket to go into space, but they aren’t interested. So, she does it herself. I’ve always loved science fiction and dogs, so I was thrilled to find two new books that would have put the 9-year -old me over the moon. 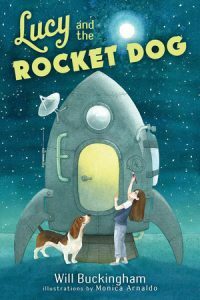 Lucy and the Rocket Dog by Will Buckinham tells the story of Lucy who loves her dog Laika and astronomy. She builds a rocket ship in her back yard and her dog accidentally takes off in it. 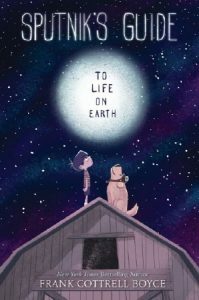 While years go by on earth where Lucy grows up and becomes a scientist, Laika travels at nearly the speed of light so her sojourn only lasts a few weeks. It is kind of sad but readers will be happy by what eventually happens, and future scientists will relish the explanation of relativity. Another great read for middle graders is Sputnik’s Guide to Life on Earth by Frank Cottrell Boyce. It is fun middle grade science fiction with lots of heart and humor. Prez, an electively mute boy in foster care answers a doorbell at the Scottish farm where he is spending the summer and meets a small alien. The alien, who is wearing goggles and a kilt, can read Prez’s mind and communicate telepathically with him. To everyone else, the alien, whose name is Sputnik Mellows, appears as various mixed breed dogs. Hilarity and trouble ensue as Prez and Sputnik try to find 10 reasons the Earth should be saved from annihilation. The author’s note at the end which gives details about the historical Sputnik and Laika as well as information about gravity waves was a nice addition. 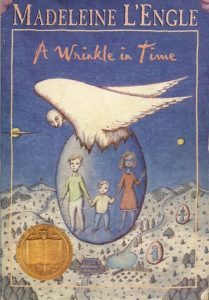 Readers who love this will want to read L’Engle’s A Wrinkle in Time and Adams’ Hitchhiker’s Guide To The Galaxy. ← What can kids do at Comic Con?